As Ursula K. Le Guin reminds us, any human power can be resisted and changed by human beings. It was the most thrilling bureaucratic document I’ve ever seen for just one reason: it was dated the twent-first day of the month of Thermidor in the Year Six. Written in sepia ink on heavy paper, it recorded an ordinary land auction in France in what we would call the late summer of 1798. But the extraordinary date signaled that it was created when the French Revolution was still the overarching reality of everyday life and such fundamentals as the distribution of power and the nature of government had been reborn in astonishing ways. The new calendar that renamed 1792 as Year One had, after all, been created to start society all over again. That document I held was written only a few years after the French had gotten over the idea that the divine right of kings was an inescapable reality. The revolutionaries had executed their king for his crimes and were then trying out other forms of government. It’s popular to say that the experiment failed, but that’s too narrow an interpretation. France never again regressed to an absolutist monarchy and its experiments inspired other liberatory movements around the world (while terrifying monarchs and aristocrats everywhere). Americans are skilled at that combination of complacency and despair that assumes things cannot change and that we, the people, do not have the power to change them. Yet you have to be abysmally ignorant of history, as well as of current events, not to see that our country and our world have always been changing, are in the midst of great and terrible changes, and are occasionally changed through the power of the popular will and idealistic movements. As it happens, the planet’s changing climate now demands that we summon up the energy to leave behind the Age of Fossil Fuel (and maybe with it some portion of the Age of Capitalism as well). To use Le Guin’s language, physics is inevitable: if you put more carbon dioxide into the atmosphere, the planet warms, and as the planet warms, various kinds of chaos and ruin are let loose. Politics, on the other hand, is not inevitable. For example, not so many years ago it would have seemed inevitable that Chevron, currently the third biggest corporation in the country, would run the refinery town of Richmond, California, as its own private fiefdom. You could say that the divine right of Chevron seemed like a given. Except that people in Richmond refused to accept it and so this town of 107,000 mostly poor nonwhites pushed back. In recent years, a group of progressives won election to the city council and the mayor’s seat, despite huge expenditures by Chevron, the corporation that also brought you gigantic oil spills onshore in Ecuador and offshore in Brazil, massive contamination from half a century of oil extraction in Nigeria, and Canadian tar-sands bitumen sent by rail to the Richmond refinery. Mayor Gayle McLaughin and her cohorts organized a little revolution in a town that had mostly been famous for its crime rate and for Chevron’s toxic refinery emissions, which periodically create emergencies, sometimes requiring everyone to take shelter (and pretend that they are not being poisoned indoors), sometimes said—by Chevron—to be harmless, as with last Thursday’s flames that lit up the sky, visible as far away as Oakland. For this November’s election, the second-largest oil company on Earth officially spent $3.1 million to defeat McLaughin and other progressive candidates and install a mayor and council more to its liking. That sum worked out to about $180 per Richmond voter, but my brother David, who’s long been connected to Richmond politics, points out that, if you look at all the other ways the company spends to influence local politics, it might be roughly ten times that. Nonetheless, Chevron lost. None of its candidates were elected and all the grassroots progressives it fought with billboards, mailers, television ads, websites, and everything else a lavishly funded smear campaign can come up with, won. If a small coalition like that can win locally against a corporation that had revenues of $228.9 billion in 2013, imagine what a large global coalition could do against the fossil-fuel giants. It wasn’t easy in Richmond and it won’t be easy on the largest scale either, but it’s not impossible. The Richmond progressives won by imagining that the status quo was not inevitable, no less an eternal way of life. They showed up to do the work to dent that inevitability. The billionaires and fossil fuel corporations are intensely engaged in politics all the time, everywhere, and they count on us to stay on the sidelines. If you look at their response to various movements, you can see that they fear the moment we wake up, show up, and exercise our power to counter theirs. That power operated on a larger scale last week, when local activists and public health professionals applied sufficient pressure to get New York Governor Andrew Cuomo to sign legislation banning fracking statewide. Until the news broke on December 17th, the outcome had seemed uncertain. It’s a landmark, a watershed decision: a state has decided that its considerable reserves of fossil fuel will not be extracted for the foreseeable future, that other things—the health of its people, the purity of its water—matter more. And once again, the power of citizens turned out to be greater than that of industry. Just a few days before the huge victory in New York, the nations of the world ended their most recent talks in Lima, Peru, about a global climate treaty—and they actually reached a tentative deal, one that for the first time asks all nations, not just the developed ones, to reduce emissions. The agreement has to get better—to do more, demand more of every nation—by the global climate summit in Paris in December of 2015. It’s hard to see how we’ll get there from here, but easy to see that activists and citizens will have to push their nations hard. We need to end the age of fossil fuels the way the French ended the age of absolute monarchy. As New York State and the town of Richmond just demonstrated, what is possible has been changing rapidly. If you look at innovations in renewable energy technologies—and this may be an era in which engineers are our unsung heroes—the future seems tremendously exciting. Not long ago, the climate movement was only hoping against hope that technology could help save us from the depredations of climate change. Now, as one of the six great banners carried in the 400,000-strong September 21st climate march in New York City proclaimed, “We have the solutions.” Wind, solar, and other technologies are spreading rapidly with better designs, lower costs, and many extraordinary improvements that are undoubtedly but a taste of what’s still to come. In parts of the United States and the world, clean energy is actually becomingcheaper than fossil fuels. The price of oil has suddenly plunged, scrambling the situation for a while, but with one positive side benefit: it’s pushed some of the filthier carbon-intensive, cutting-edge energy extraction schemes below the cost-effective point for now. The costs of clean energy technology have themselves been dropping significantly enough that sober financial advisers like the head of the Bank of England are beginning to suggest that fossil fuels and centralized conventional power plants may prove to be bad investments. They are also talking about “the carbon bubble” (a sign that the divestment movement has worked in calling attention to the practical as well as the moral problems of the industry). So the technology front is encouraging. That’s the carrot for action; there’s also a stick. If you look at the climate reports by the scientists—and scientists are another set of heroes for our time—the news only keeps getting scarier. You probably already know the highlights: chaotic weather, regular records set for warmth on land and at sea (and 2014 heading for an all-time heat high), 355 months in a row of above-average temperatures, more ice melting faster, more ocean acidification, the “sixth extinction,” the spread of tropical diseases, drops in food productivity with consequent famines. So many people don’t understand what we’re up against, because they don’t think about the Earth and its systems much or they don’t grasp the delicate, intricate reciprocities and counterbalances that keep it all running as well as it has since the last ice age ended and an abundant, calm planet emerged. For most of us, none of that is real or vivid or visceral or even visible. For a great many scientists whose fields have something to do with climate, it is. In many cases they’re scared, as well as sad and unnerved, and they’re clear about the urgency of taking action to limit how disastrously climate change impacts our species and the systems we depend upon. Some non-scientists already assume that it’s too late to do anything, which—as premature despair always does—excuses us for doing nothing. Insiders, however, are generally convinced that what we do now matters tremendously, because the difference between the best- and worst-case scenarios is vast, and the future is not yet written. 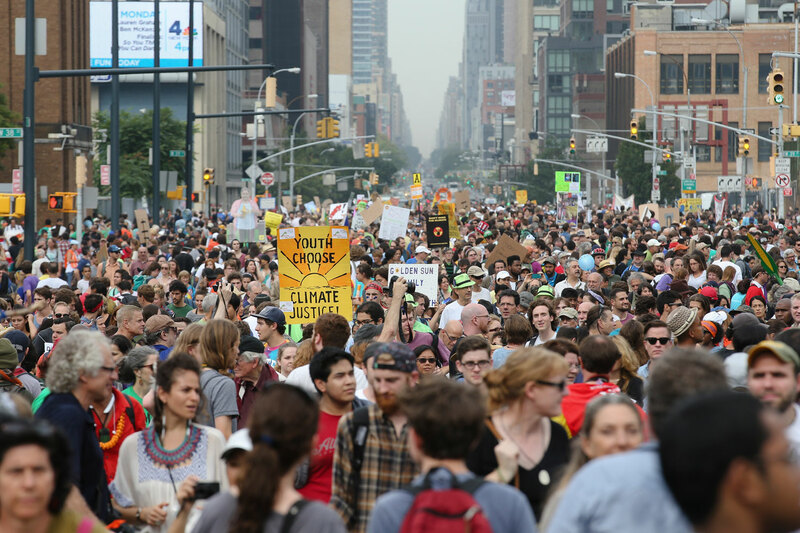 After that huge climate march, I asked Jamie Henn, a cofounder of and communications director for 350.org, how he viewed this moment and he replied, “Everything’s coming together while everything’s falling apart,” a perfect summary of the way heartening news about alternative energy and the growth of climate activism exists in the shadow of those terrible scientific reports. This brings us to our third group of heroes, who fall into the one climate category that doesn’t require special qualifications: activists. New technologies are only solutions if they’re implemented and the old carbon-emitting ones are phased out or shut down. It’s clear enough that the great majority of fossil fuel reserves must be kept just where they are—in the ground—as we move away from the Age of Petroleum. That became all too obvious thanks to a relatively recent calculation made by scientists and publicized and pushed by activists (and maybe made conceivable by engineers designing replacement systems). The goal of all this: to keep the warming of the planet to 2 degrees Celsius (3.5 degrees Fahrenheit), a target established years ago that alarmed scientists are now questioning, given the harm that nearly 1 degree Celsius of warming is already doing. Dismantling the fossil-fuel economy would undoubtedly have the side effect of breaking some of the warping power that oil has had in global and national politics. Of course, those wielding that power will not yield it without a ferocious battle—the very battle the climate movement is already engaged in on many fronts, from the divestment movement to the fight against fracking to the endeavor to stop the Keystone XL pipeline and others like it from delivering the products of the Alberta tar sands to the successful movement to shut down coal-fired power plants in the United States and prevent others from being built. If everyone who’s passionate about climate change, who gets that we’re living in a moment in which the fate of the Earth and of humanity is actually being decided, found their place in the movement, amazing things could happen. What’s happening now is already remarkable enough, just not yet adequate to the crisis. The divestment movement that arose a couple of years ago to get institutions to unload their stocks in fossil fuel corporations started modestly. It is now active on hundreds of college campuses and at other institutions around the world. While the intransigence or love of inertia of bureaucracies is a remarkable force, there have been notable victories. In late September, for instance, the Rockefeller Brothers Fund—made fat upon the wealth of John D. Rockefeller’s founding role in the rise of the petroleum industry—pledged to divest its $860 million in assets from fossil fuels. It is just one of more than 800 institutions, including church denominations, universities, cities, pension funds, and foundations from Scotland to New Zealand to Seattle, that have already committed to doing so. The Keystone pipeline could have been up and running years ago, delivering the dirtiest energy from Alberta, Canada, to the US Gulf Coast with little fanfare, had activists not taken it on. It has become a profoundly public, hotly debated issue, the subject of demonstrations at dozens of presidential appearances in recent years—and in the course of this ruckus, a great many people (including me) were clued in to the existence of the giant suppurating sore of sludge, bitumen, and poison lakes that is the Alberta tar sands. Canadian activists have done a similarly effective job of blocking other pipelines to keep this landlocked stuff from reaching any coast for export. One upshot of this: quite a lot of the stuff is now being put on trains (withdisastrous results when they crash and, in the longer term, no less disastrous outcomes when they don’t). This exceptionally dirty crude oil leaves behind extremely high levels of toxins in the mining as well as the refining process. The climate movement has proved to be bigger and more effective than it looks, because most people don’t see a single movement. If they look hard, what they usually see is a wildly diverse mix of groups facing global issues on the one hand and a host of local ones on the other. Domestically, that can mean Denton, Texas, banning fracking in the November election or theshutting down of coal-powered plants across the country, or the movement gearing up in California for an immense anti-fracking demonstration on February 7, 2015. Just before that September climate march in New York, I began to contemplate how human beings a century from now will view those of us who lived in the era when climate change was recognized, and yet there was so much more that we could have done. They may feel utter contempt for us. They may regard us as the crew who squandered their inheritance, like drunkards gambling away a family fortune that, in this case, is everyone’s everywhere and everything. I’m talking, of course, about the natural world itself when it was in good working order. They will see us as people who fiddled while everything burned. They will think that we should have thrown our bodies in front of the engines of destruction everywhere, raised our voices to the heavens, halted everything until the devastation stopped. They will bless and praise the few and curse the many. There have been heroic climate activists in nearly every country on the planet, and some remarkable things have already been achieved. The movement has grown in size, power, and sophistication, but it’s still nowhere near commensurate with what needs to be done. In the lead-up to the UN-sponsored conference to create a global climate treaty in Paris next December, this coming year will likely be decisive. Many people believe that personal acts in private life are what matters in this crisis. They are good things, but not the key thing. It’s great to bicycle rather than drive, eat plants instead of animals, and put solar panels on your roof, but such gestures can also offer a false sense that you’re not part of the problem. You are not just a consumer. You are a citizen of this Earth and your responsibility is not private but public, not individual but social. If you are a resident of a country that is a major carbon emitter, as is nearly everyone in the English-speaking world, you are part of the system, and nothing less than systemic change will save us. The race is on. From an ecological standpoint, the scientists advise us that we still have a little bit of time in which it might be possible, by a swift, decisive move away from fossil fuels, to limit the damage we’re setting up for those who live in the future. From a political standpoint, we have a year until the Paris climate summit, at which, after endless foot-shuffling and evading and blocking and stalling and sighing, we could finally, decades in, get a meaningful climate deal between the world’s nations. We actually have a chance, a friend who was at the Lima preliminary round earlier this month told me, if we all continue to push our governments ferociously. The real pressure for change globally comes more from within nations than from nations pressuring one another. Here in the United States, long the world’s biggest carbon-emitter (until China outstripped us, partly by becoming the manufacturer of a significant percentage of our products), we have a particular responsibility to push hard. Pressure works. The president is clearly feeling it, and it’s reflected in the recent US-China agreement on curtailing emissions—far from perfect or adequate, but a huge step forward. How will we get to where we need to be? No one knows, but we do know that we must keep moving in the direction of reduced carbon emissions, a transformed energy economy, an escape from the tyranny of fossil fuel, and a vision of a world in which everything is connected. The story of this coming year is ours to write and it could be a story of Year One in the climate revolution, of the watershed when popular resistance changed the fundamentals as much as the people of France changed their world (and ours) more than 200 ago. Two hundred years hence, may someone somewhere hold in their hands a document from 2021, in wonder, because it was written during Year Six of the climate revolution, when all the old inevitabilities were finally being swept aside, when we seized hold of possibility and made it ours. “Any human power can be resisted and changed by human beings,” says Ursula K. Le Guin. And she’s right, even if it’s the hardest work we could ever do. Now, everything depends on it.